Many builders, homeowners and business owners are interested in LEED sustainability and green building materials to meet regulatory requirements or to simply create the most sustainable project possible. At Nitterhouse Concrete Products, we offer sustainable building materials that can help your dreams of greenbuilding become a reality. We offer a selection of green building materials that offer the quality and durability you require for your project. When you are working toward LEED sustainability on green building projects in the Mid-Atlantic area, you can’t skimp on quality in the effort to go green. We are your best source for the durable and sustainable materials you require. We at Nitterhouse Concrete Products know your project is unique. We want to help you see your unique vision become a reality, which includes making green building materials available for all kinds of construction projects. Our EcoSmart materials are known to contribute to LEED performance. We also keep up with the latest in greenbuilding technology and innovations so we can make the latest and greatest sustainable building materials available for your projects. What you gain in sustainability you won’t lose in terms of quality and durability. We offer only sustainable building materials that will provide the long-term performance you want and need. 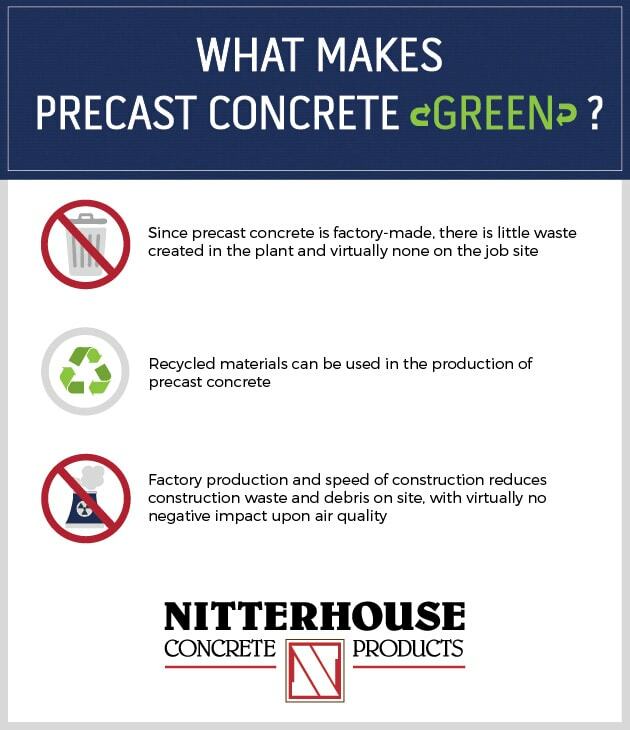 Why is Precast Concrete “Green”? 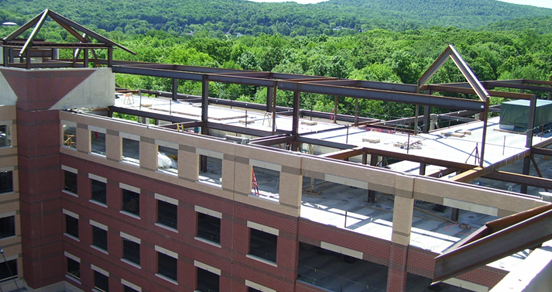 Precast Concrete can contribute toward LEED building certification. *A number of credits are interrelated and it may be necessary to choose the credits for which the points apply. For a plant to become part of the PCI plant certification program, the plant must meet strict standards, which typically go hand in hand with being the most up to date on green qualifications and waste reduction. We are the partner of choice for construction projects in Chambersburg and surrounding areas in the Northeast. Our team includes engineering professionals who work closely with design development teams to provide the most effective and economical solutions possible. Our team members are adept at helping projects meet sustainable building material requirements, incorporating greenbuilding principles into any project. We also establish a partnership that helps a project move through its stages efficiently, helping things to stay on schedule. For projects of any scope and specifications, Nitterhouse Concrete Products can be a valued member of the project team. At Nitterhouse Concrete Products, we’re driven to achieve quality in everything we do. That means quality sustainable building materials, as well as quality customer service and insights that help you make the most of your construction project. For five generations, we’ve been helping clients throughout the Mid-Atlantic area achieve the best possible results. How can we be of service on your project? Our depth of experience, knowledge, tools and resources can help maximize your work and help you achieve outstanding results. Contact Nitterhouse Concrete Products today about sustainable building materials for your project.